All incident sunlight not reflected as albedo is absorbed by Earth and eventually re-emitted as IR energy or blackbody radiation (see Sec. 9.2). While this balance is maintained fairly well on a global annual average basis, the intensity of IR energy emitted at any given time from a particular point on Earth can vary considerably depending on factors such as the local temperature of Earth's surface and the amount of cloud cover. A warmer surface region will emit more radiation than a colder one. Generally, highest values of Earth emitted IR will occur in tropical and desert regions (as these are the regions of the globe receiving the maximum solar heating) and will decrease with increasing latitude. Cloud cover tends to lower Earth emitted IR because cloud tops are cold and clouds effectively block up-welling radiation from the Earth's warmer surface below. These localized variations in Earth emitted IR, while significant, are much less severe than the variations in albedo. Representative orbit-average values for Earth IR are shown in Table 11-45A. The IR energy emitted by the Earth, which has an effective average temperature around -18 °C, is of approximately the same wavelength as that emitted by spacecraft; that is, it is of much longer wavelength than the energy emitted by the Sun at 5500 °C. Unlike short-wavelength solar energy, Earth IR loads incident on a spacecraft cannot be reflected away from radiator surfaces with special thermal-control coatings, since the same coatings would prevent the radiation of waste heat away from the spacecraft. Because of this, Earth-emitted IR energy can present a particularly heavy backload on spacecraft radiators in low-altitude orbits. Usually the spacecraft is warmer than the effective Earth temperature, and the net heat transfer is from spacecraft to Earth. However, for analysis, it is convenient to ignore Earth when calculating radiant heat rejection from the spacecraft to space and to assume that Earth does not block the view to space. Then the difference in IR energy is added back in as an "incoming" heat rate called Earth-emitted IR. Another significant form of environmental heating is known as free molecular heating (FMH). This is a result of bombardment of the vehicle by individual molecules in the outer reaches of the atmosphere. For most spacecraft, FMH is only encountered during launch ascent just after the booster's payload fairing is ejected. It is desirable to drop the fairing as soon as possible after launch to minimize the amount of dead weight the booster must deliver to orbit. The point at which the fairing is separated is often determined by a trade-off between the desire to save weight and the need to protect the spacecraft from excessive atmospheric heating. 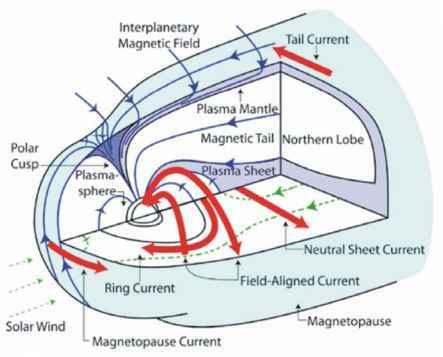 Some spacecraft also experience FMH if they have exceptionally low perigee altitudes or use aerobrakmg maneuvers that cause them to dip into a planet's atmosphere. In most cases, FMH effects can be tolerated by the on-orbit thermal design so that no special thermal design changes are required to protect the spacecraft from it. Planetary and lunar IR and albedo environments are given in Table 11-45B. They vary widely due to the various planet's different distances from the Sun and different atmosphere and surface characteristics. Gilmore  provides a detailed characterization of the thermal environments of the planets. TABLE 11-45B. Albedo and IR Emission of the Planets. This table shows representative values of albedo and IR emission for the planets of our Solar System. Perihelion and aphelion represent the points In the orbits of Mercury and Mars where they are closest and furthest from the Sun.